Available from TFC, the MD series enhanced range of variable moulded inductors, used in FM radio, satellite receiver, car navigation system, CATV and cable TV applications, with a choice of core materials; carbonyl, aluminium, brass and ferrites, offering high temperature stability. The interesting thing about the core materials is when using ferrite or carbonyl cores, the minimum inductance is measured with the core in a mid-position within the bobbin. When using aluminium or brass cores, the inductance max. is measured with the core half way out of the bobbin. These variable molded inductors offer a very wide inductance range and multiple choice of model size and frequency of operation. Operating from inductance ranges of 0.01uH ~ 1.5uH and frequencies ranging from 10MHz~ 500MHz. With a package size of 12.7mm x 18.8mm, which can be supplied shielded or unshielded. 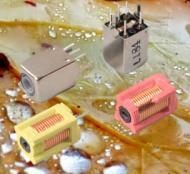 These variable inductors have a very high stability and are perfect for being used in r.f. designs. There is such a wide range of inductors for this range all of which are RoHS compliant and each inductor has a unique amount of turns to cater for anyone specification needs.